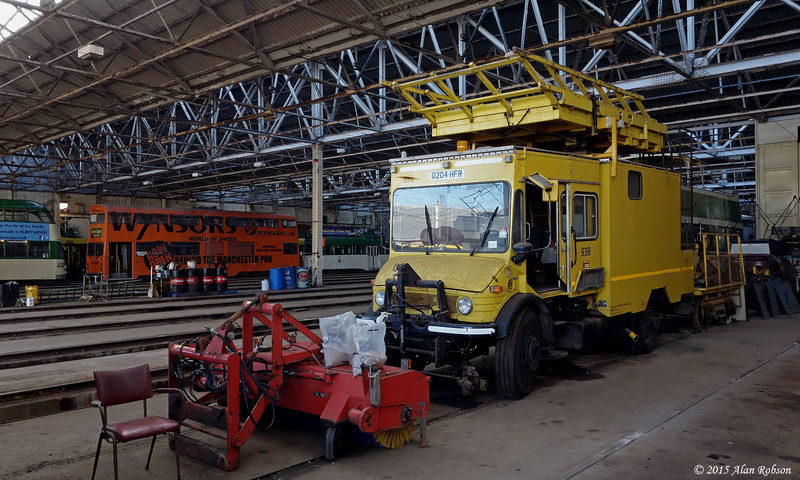 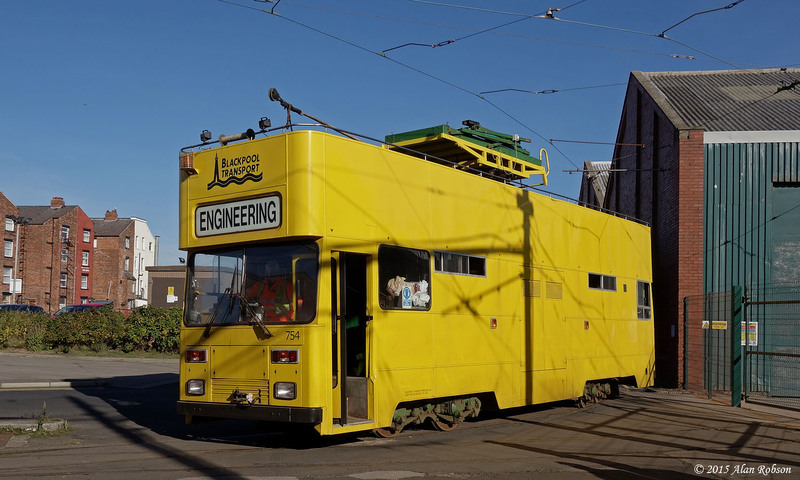 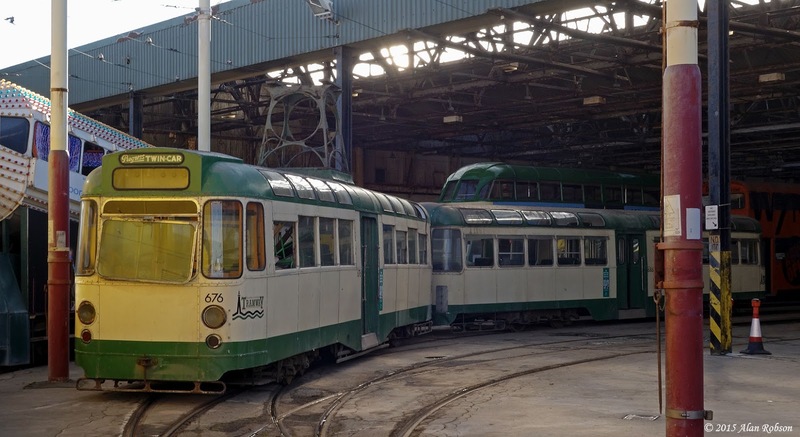 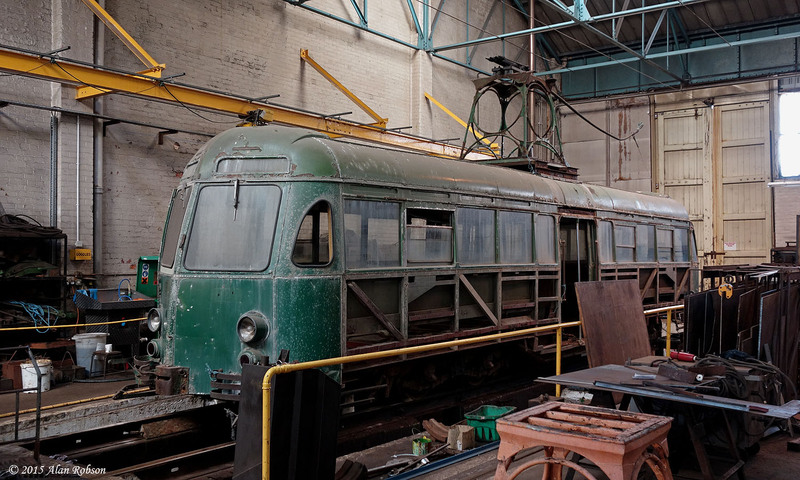 As part of the Tramway's 130th celebrations, a series of depot tours were organised for both the Saturday and Sunday, with these having to be pre-booked in advance. 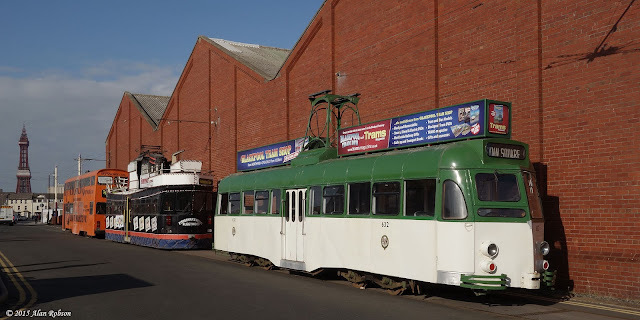 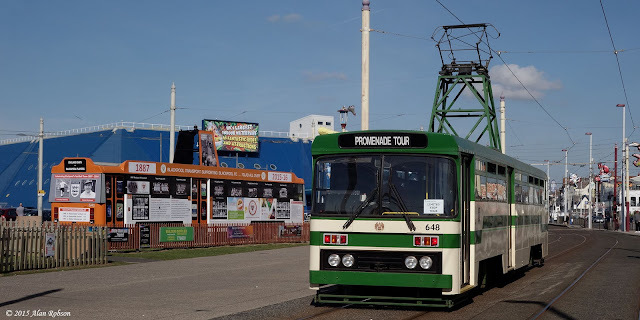 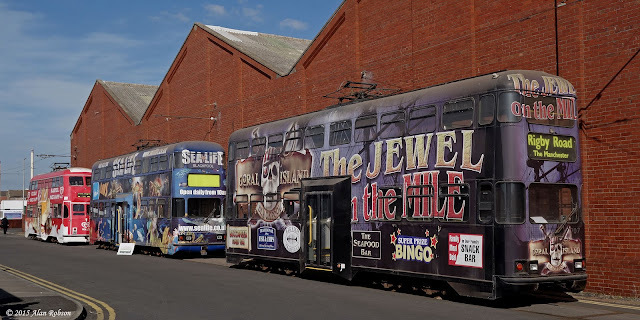 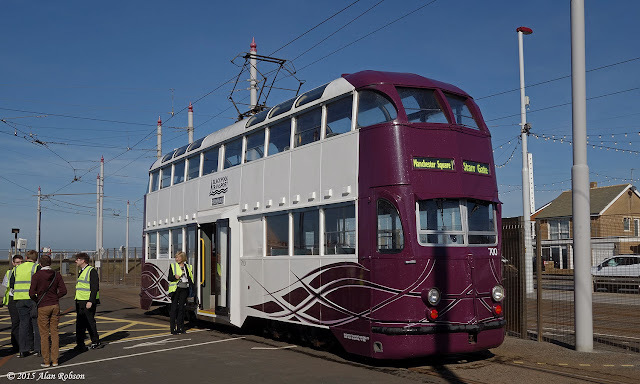 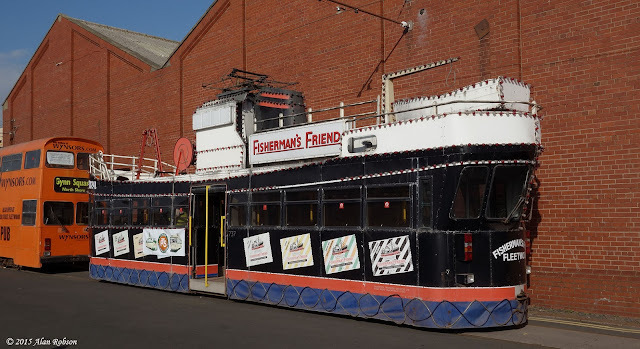 All the tours were completely sold out well before the event, with several heritage trams being strategically positioned around Rigby Road depot especially for the open days. 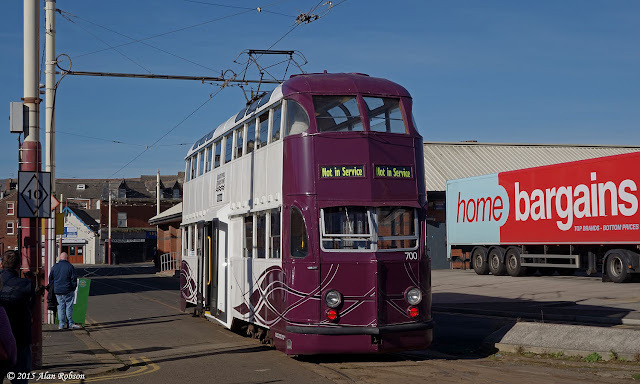 On Sunday the depot tour first visited the electrical compound, where Balloon 700 was stabled, waiting to take up its duties on the depot shuttle service. A visit to the paint shop saw Dennis Trident 333 in grey primer paint before being painted into fleet livery, OMO Car 8 was also on view in the paint shop, although this tram is very much a long term project due having a fractured underframe, and it could be 10 years before it re-enters service again. 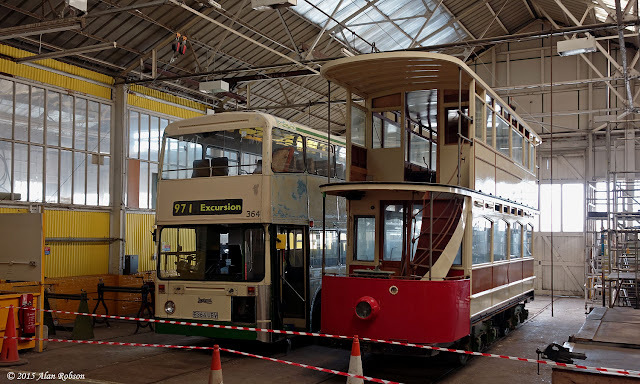 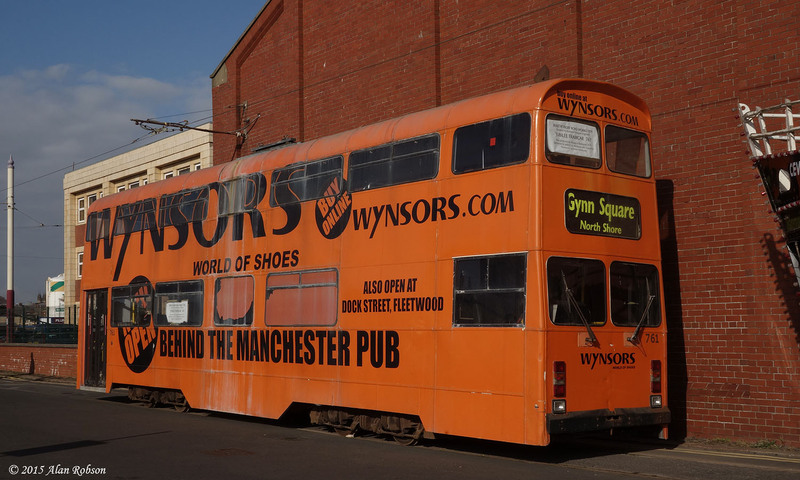 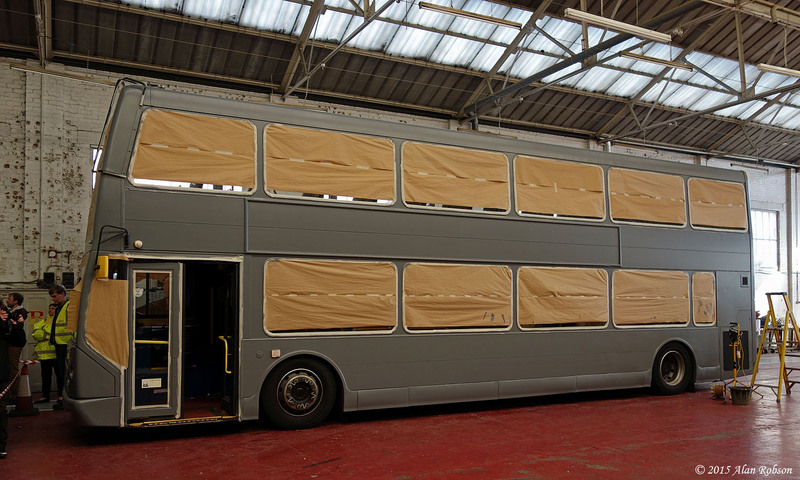 Next door in the body shop, preserved Leyland Atlantean 364 was awaiting attention, alongside it was unvestibuled Standard Car 143. 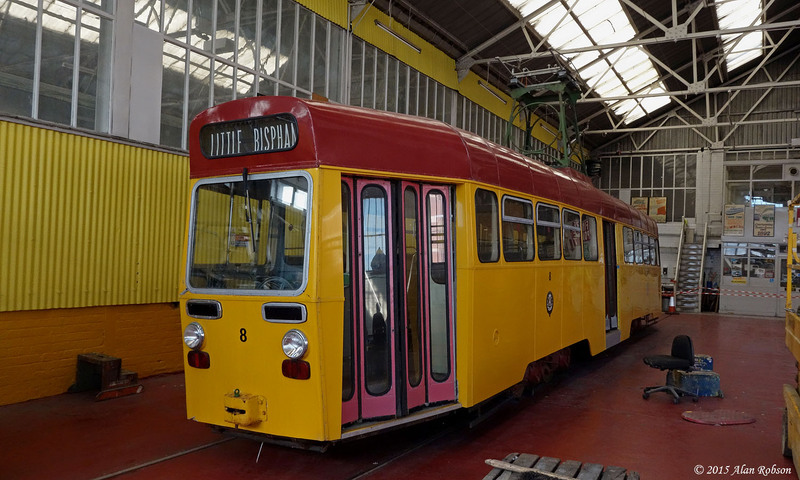 Standard 143 had a significant amount of restoration work done to it while under the care of the Lancastrian Transport Trust, and there is a possibility that this tram's restoration could be finally completed over the coming winter in time for it to enter heritage service in 2016, if the necessary finance is made available. 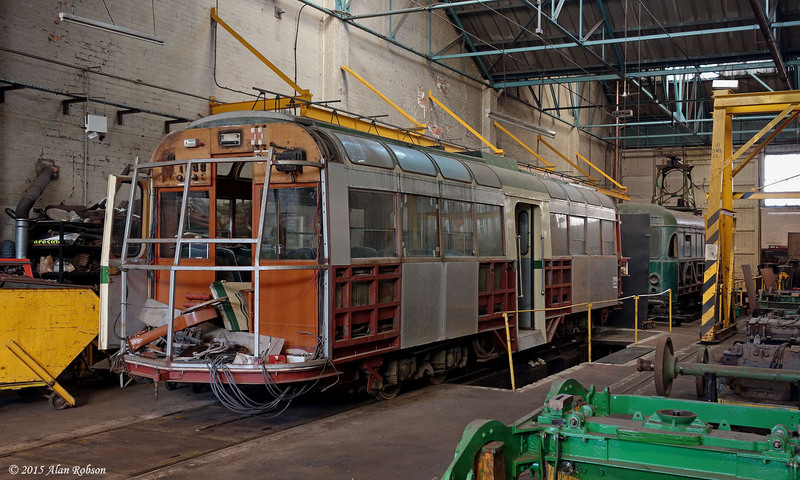 Moving on to the fitting shop there were two more long term projects on display, Brush Car 259, the former permanent way tram, and Railcoach 279, which is to be restored back into its original streamlined English Electric configuration. 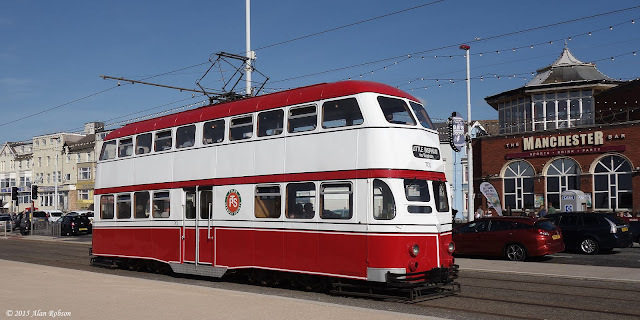 As part of the Blackpool Tramway 130th Anniversary celebrations, four preserved Blackpool buses operated a free service around the town. 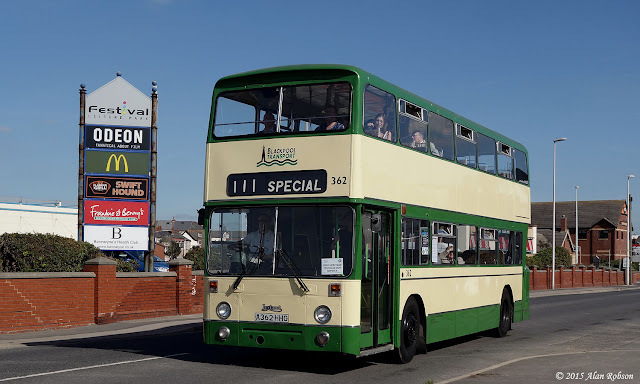 The vehicles in use on the heritage bus service were 1967 MCW bodied Leyland Titan PD3 501 (HFR 501E), 1970 Marshall bodied AEC Swift 554 (PFR 554H), 1983 East Lancs bodied Leyland Atlantean 362 (A362 HHG) and Optare Delta bodied DAF SB220 133 (H3 FBT), new to Fylde Borough Transport in 1991. 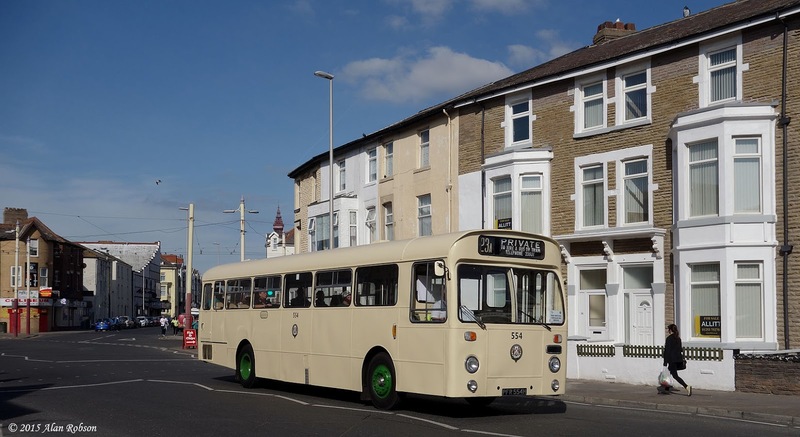 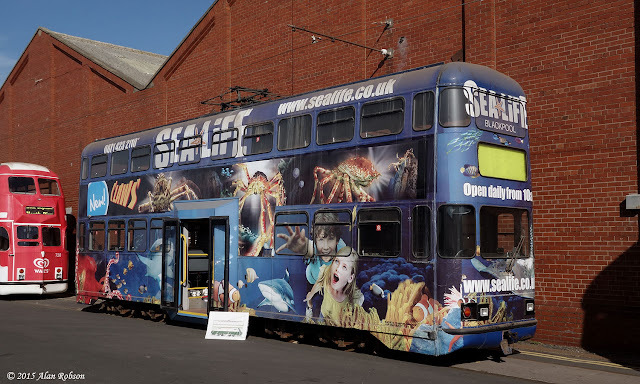 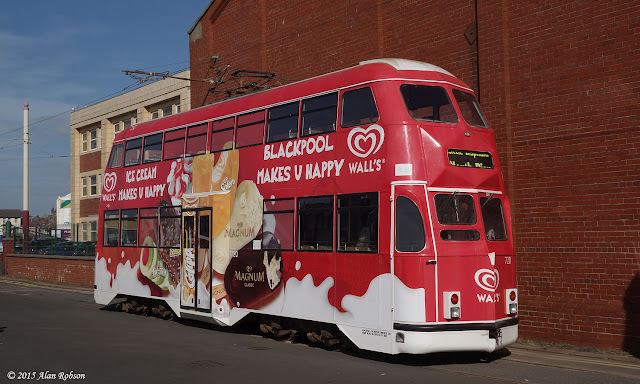 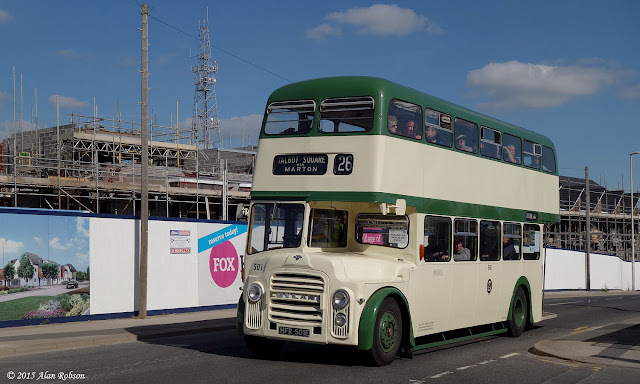 The four buses ran short tours around the Lytham Road, Central Drive and Promenade area. 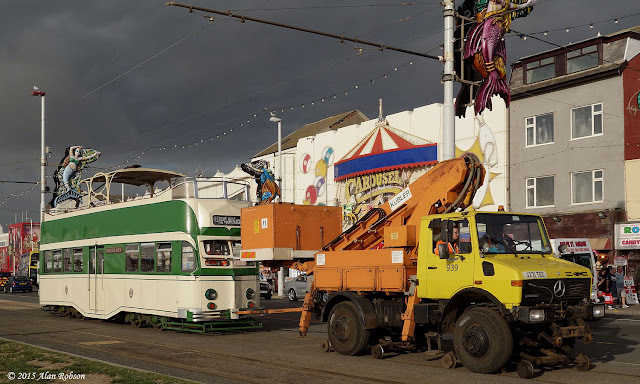 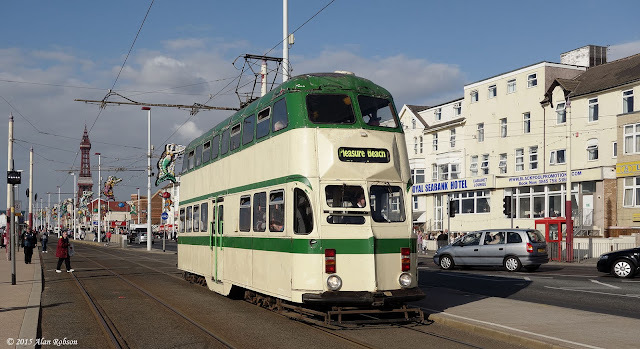 The second day of Blackpool Tramway's 130th anniversary celebrations weekend saw another intensive service from the heritage fleet using a wide variety of trams. 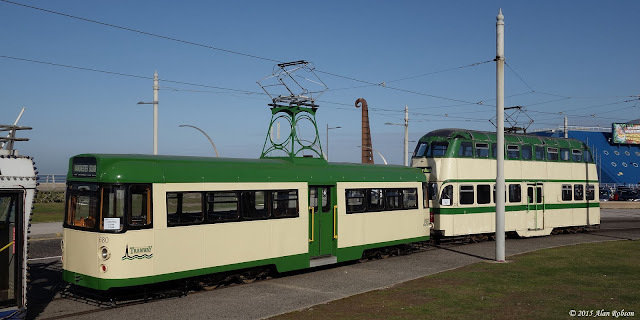 Newly repainted Twin Set 675/685 was in use again, along with 40, 147, 227, 230, 631, 701, 717, 723, 272/T2 and the Western Train, all operating on the normal Heritage Tours, with Centenaries 642 and 648 in use again on the Starr Gate service. 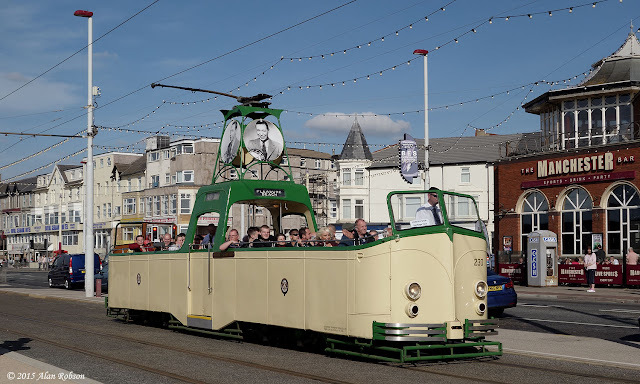 Two 'B' fleet Balloons were also out again, with 700 operating the Hopton Road to Starr Gate shuttle, including a trip through the working tram wash for those people who were booked on the depot tours, and 719 again positioned on the siding at North Pier in use as the 130th anniversary souvenir shop. 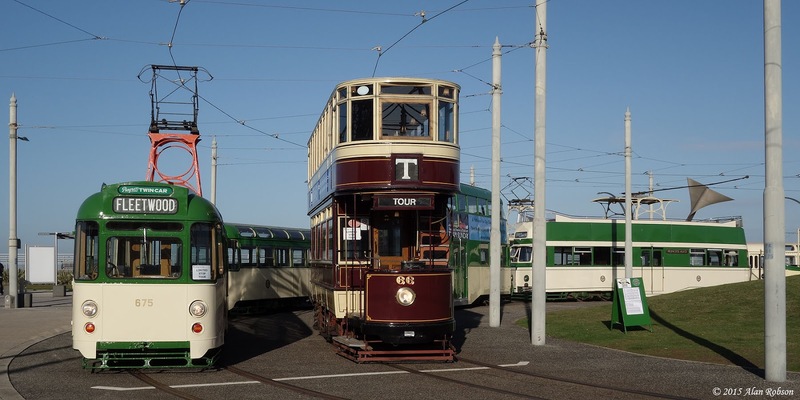 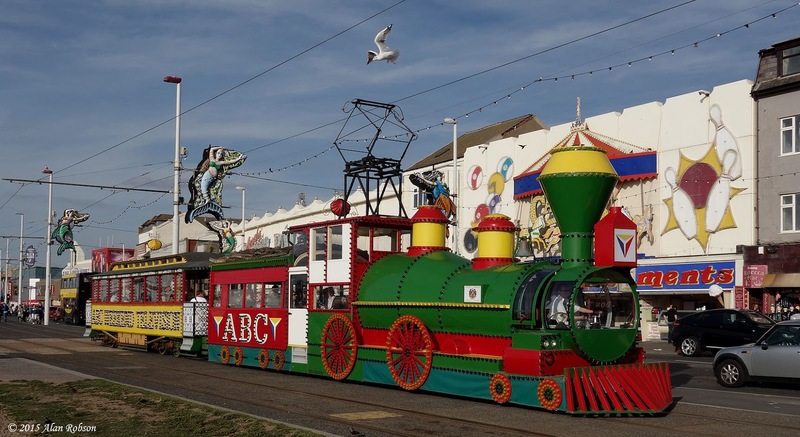 In addition to the heritage service on the Promenade there was also a line-up of trams in Blundell Street, consisting of Balloons 707, 709 and 720. 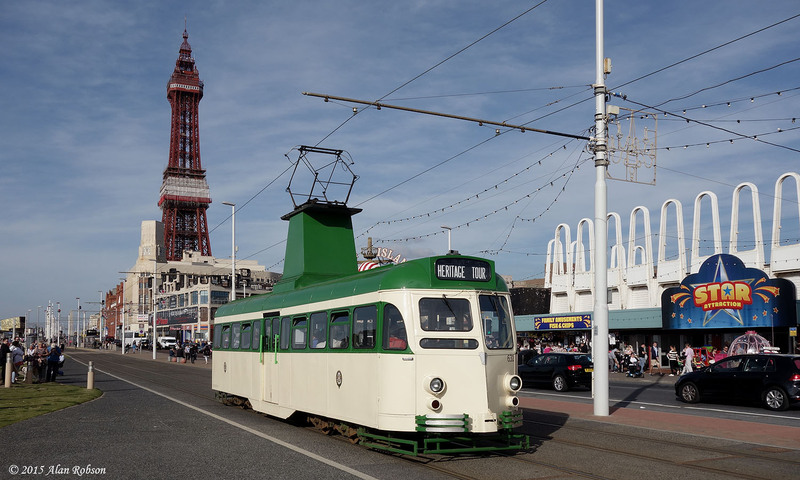 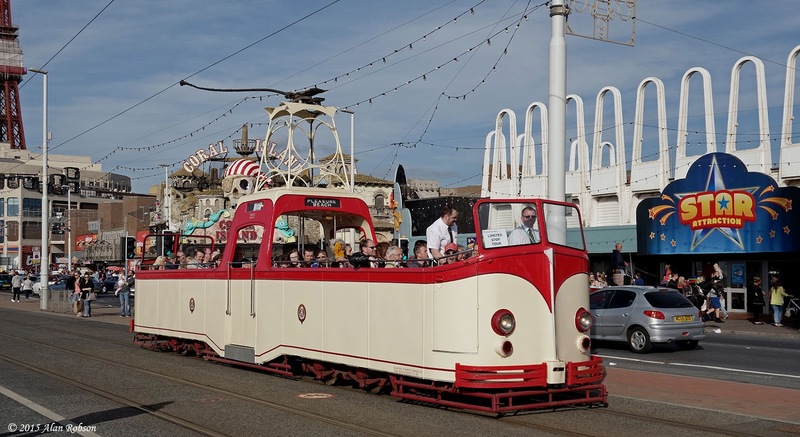 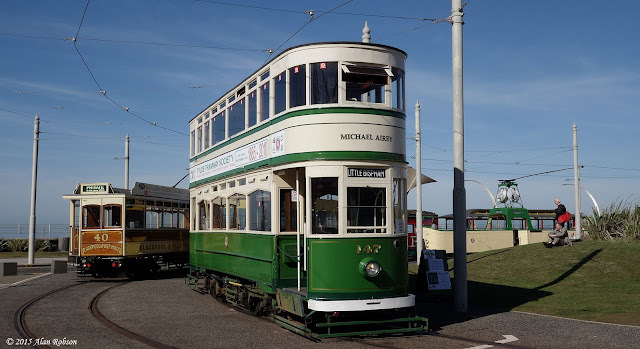 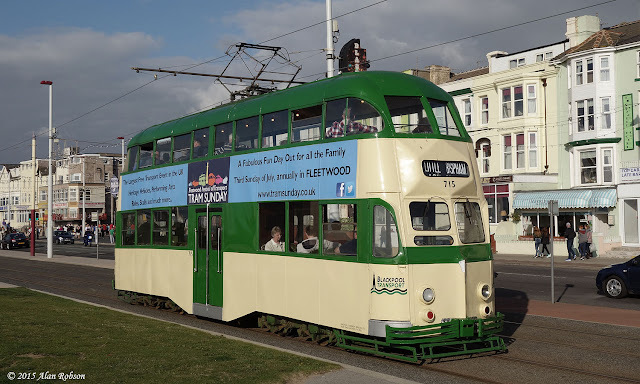 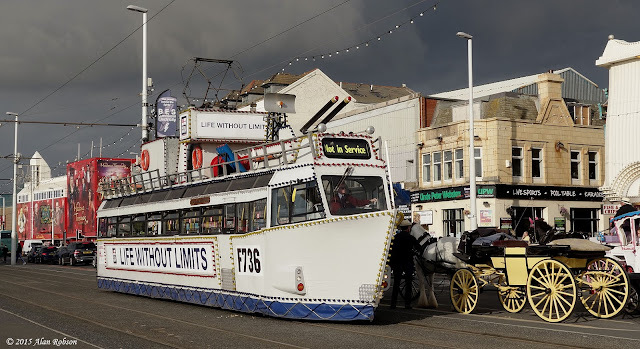 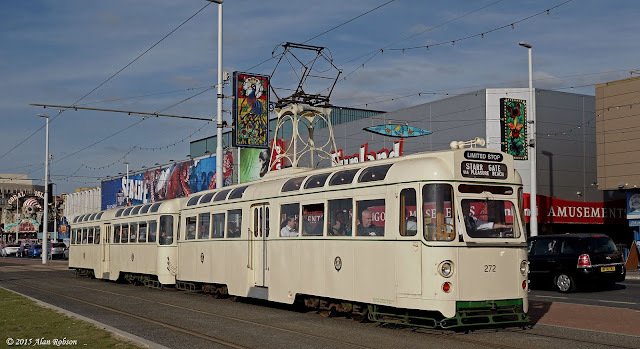 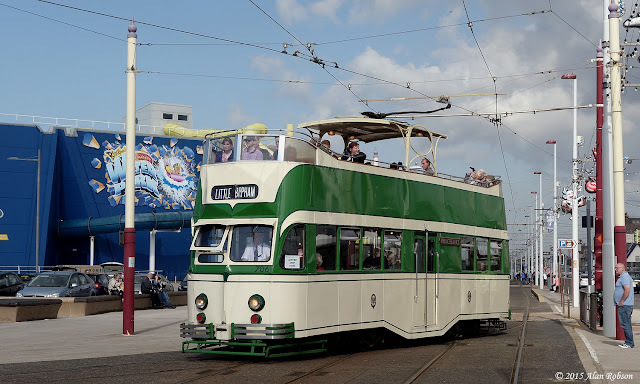 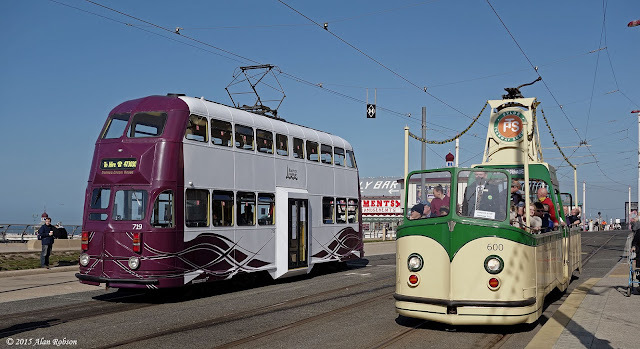 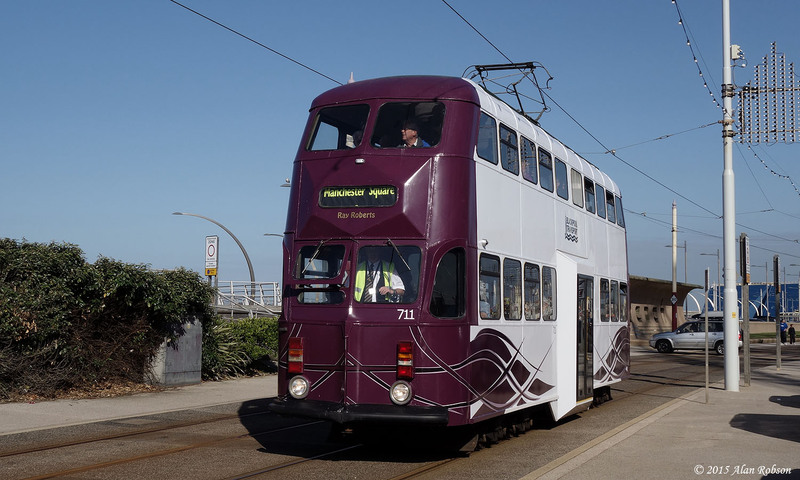 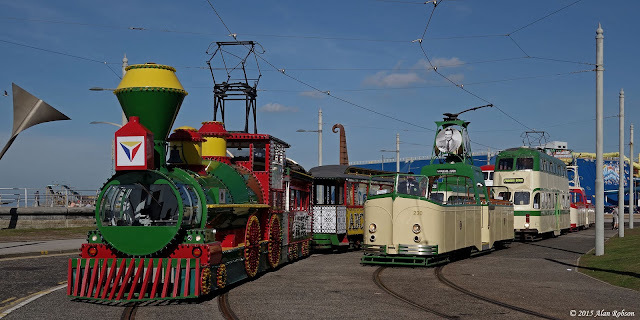 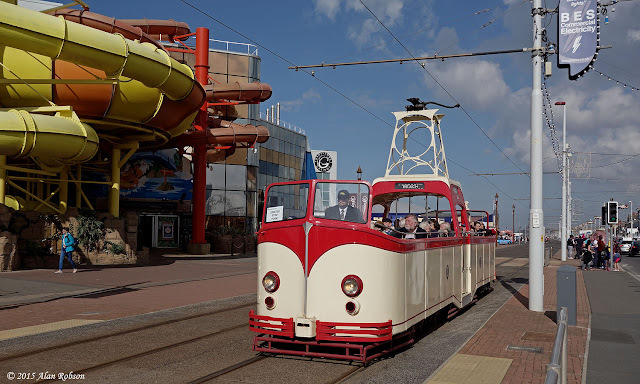 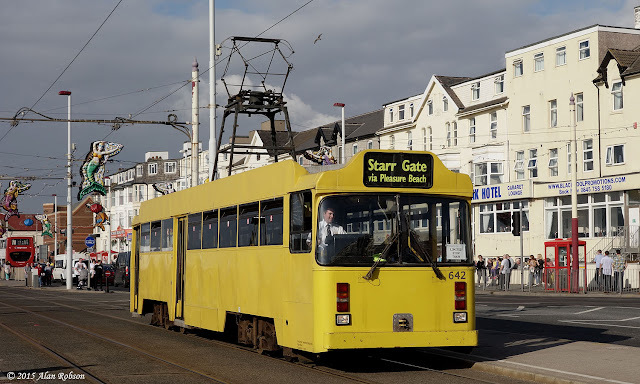 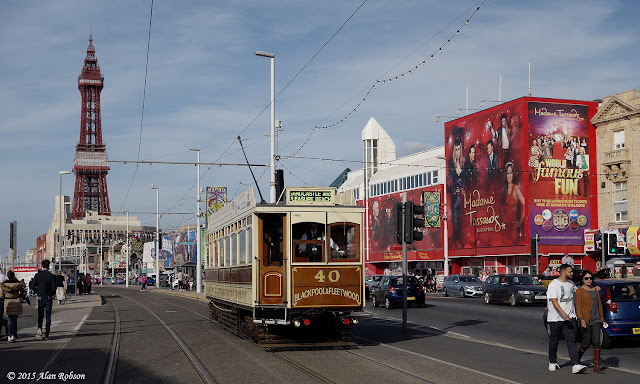 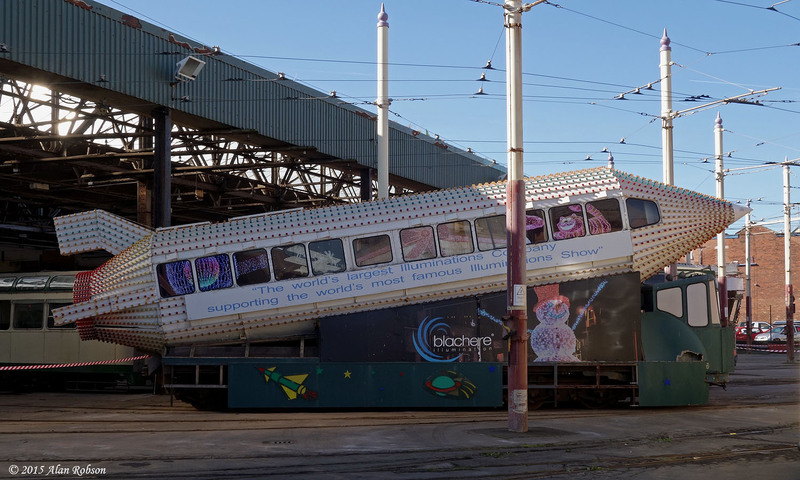 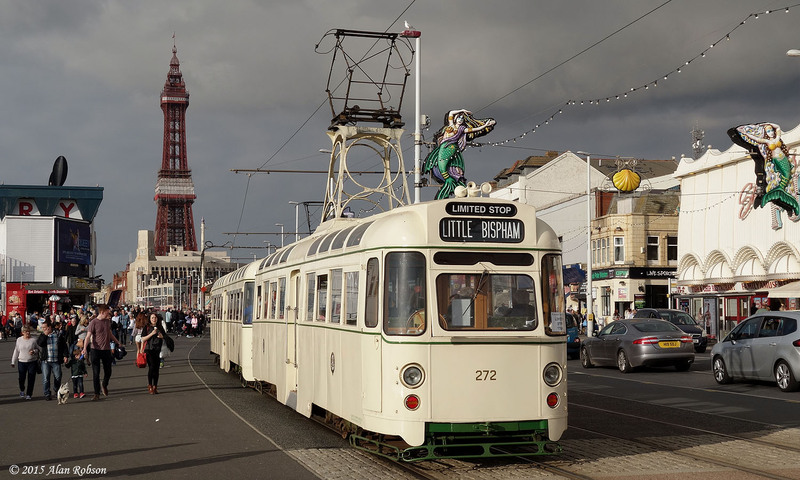 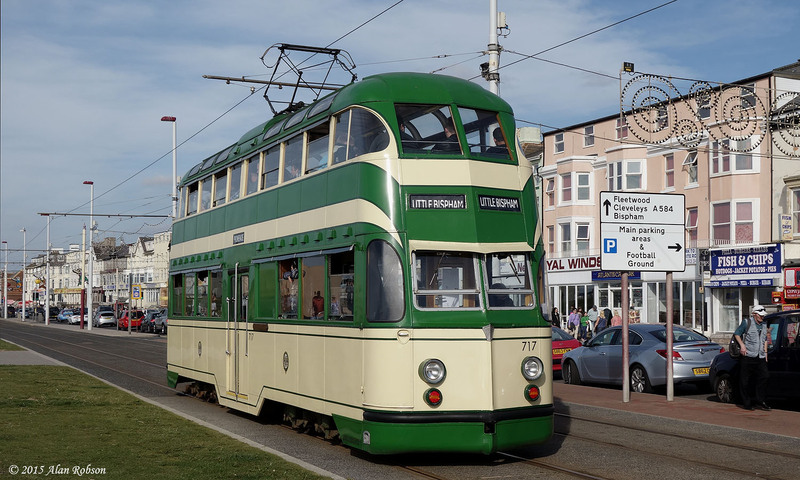 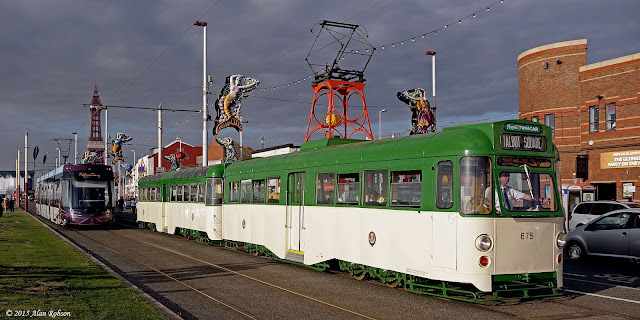 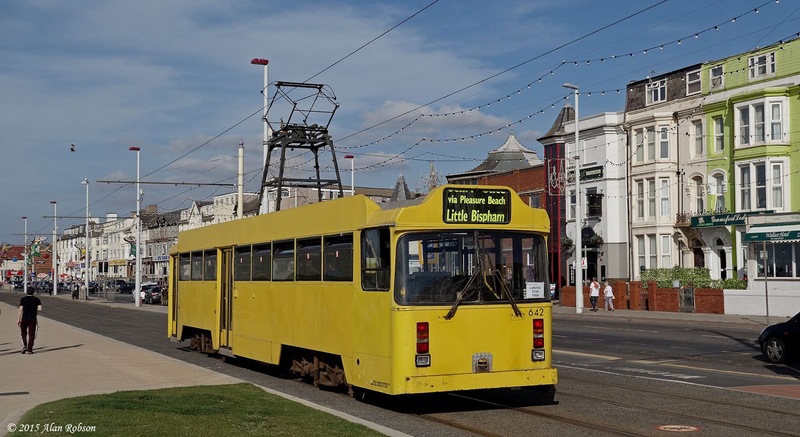 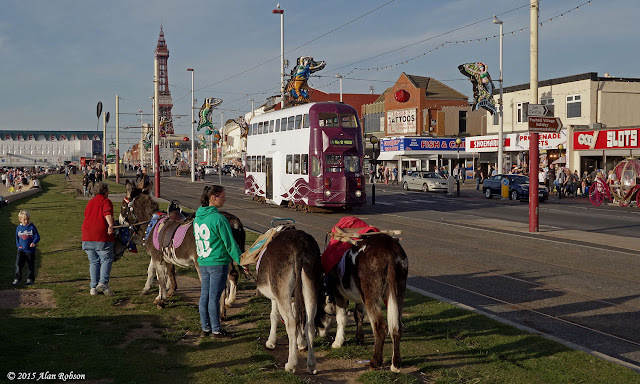 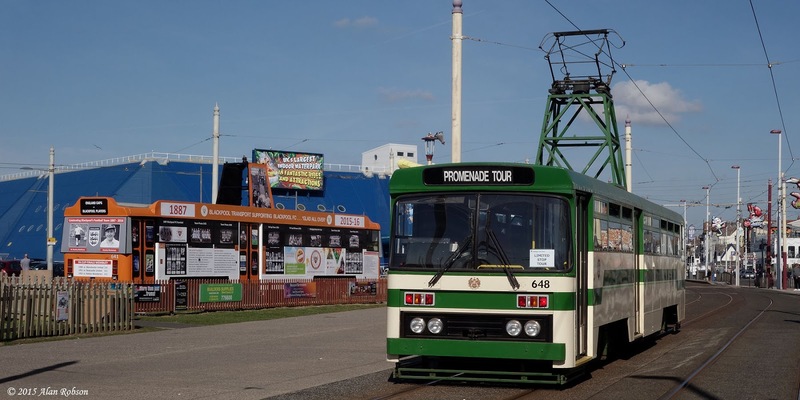 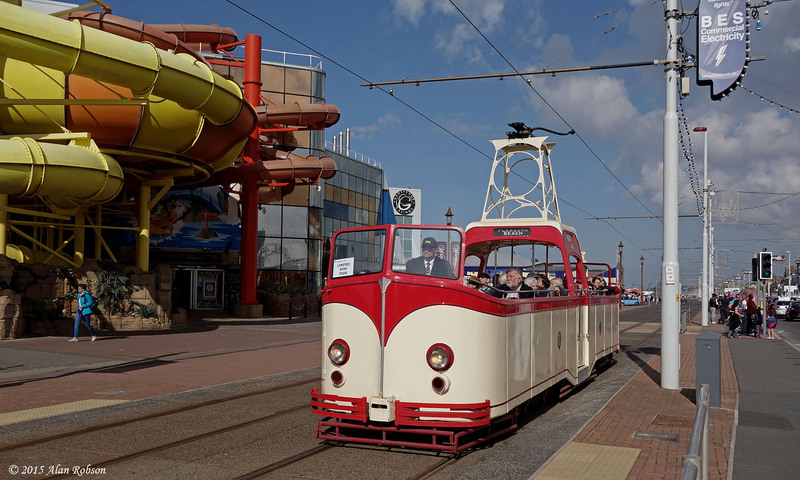 The weekend of 26th and 27th September was chosen for Blackpool Tramway's 130th anniversary celebrations, with as many trams from the heritage fleet as possible being used over the two days. 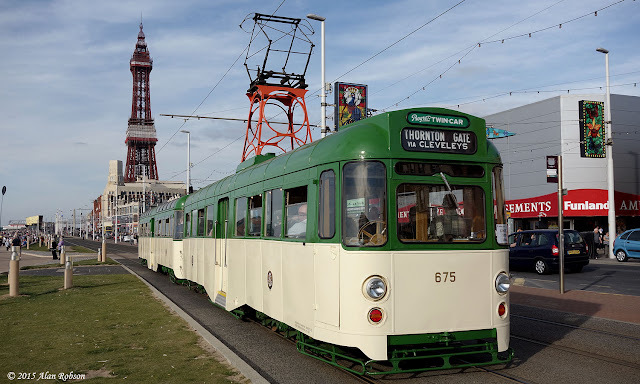 The landmark event of the weekend was the re-entry into service of Twin Set 675/685 freshly repainted into a 1960s style green and cream livery, complete with an orange trolley tower. 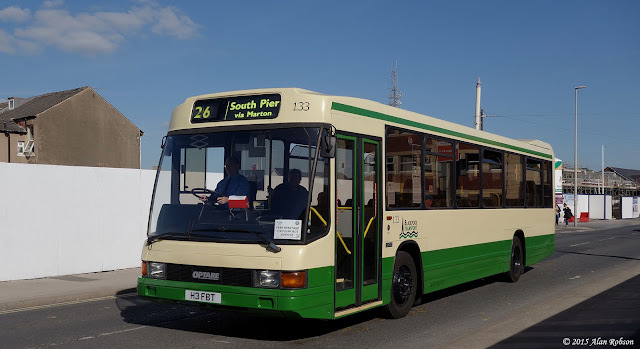 The other debut of the day was Balloon 723 newly stripped of its black overall advertising vinyls, revealing the green and cream colour scheme that was underneath the advert. 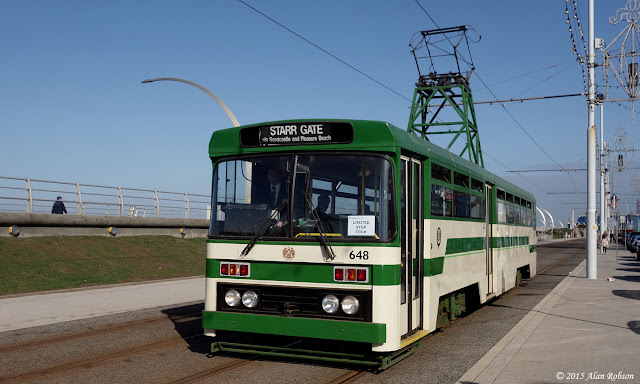 In addition to the aforementioned trams, 66, 227, 600, 680, 706, 715, 736 and 272/T2 were operating the normal Heritage Tours, with Centenaries 642 and 648 on a Starr Gate service. 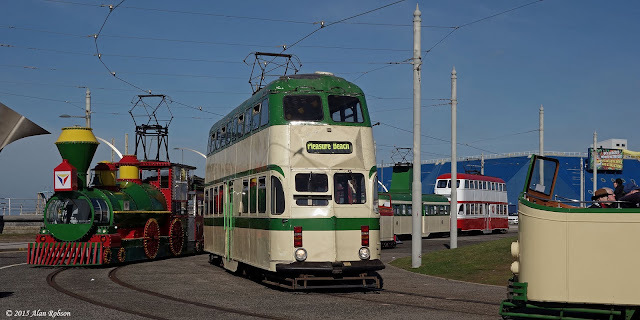 Two 'B' fleet Balloons were also out for the day, with 711 operating a Hopton Road to Starr Gate shuttle, including a trip through the working tram wash for those people who were booked on the depot tours, and 719 stationed on the siding at North Pier being used as a 130th memorabilia shop. In addition to the action on the Promenade there was also a line-up of trams on Blundell Street, consisting of Brush Car 632, Trawler 737 and Jubilee Car 761. 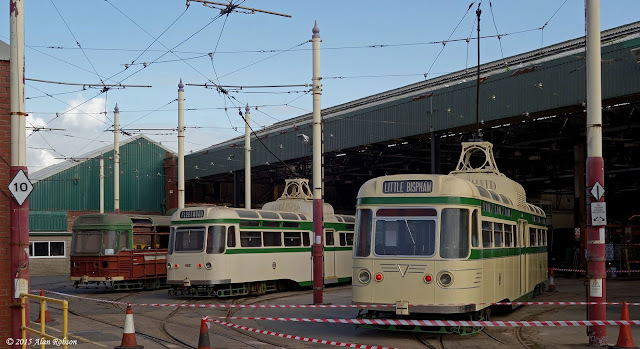 Within the depot confines Coronation Cars 663, 660 and 304 were parked alongside each other on the track fan.